An elephant is a big animal. It is the biggest of all land animals. They are very faithful and intelligent. We have provided the essay on an elephant for school students. You can choose any one essay or paragraph according to your need or requirement. 1. An elephant is the biggest animal on the earth. 2. The colour of its skin is black. 3. It lives in the dense forest. 4. It has a big body, four thick legs, two large ears, two small eyes, and a short tail. 5. It also has a long trunk from head to the ground. 6. It is found in the forest of Africa, India and Burma. 7. An angry elephant is very dangerous. 8. In the past, it is used in the war or battle-field. 9. It is a strong and intelligent animal. 10. It is also useful even after its death. 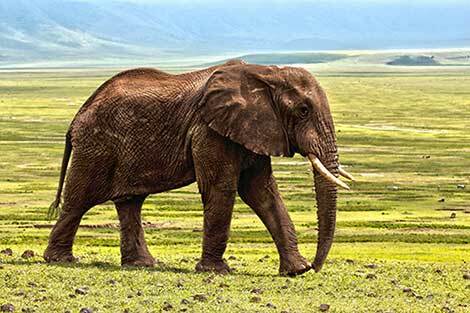 The elephant is the largest land animal on the earth. Its legs are like pillars, and its ears are like fans. It has a huge head with two very small eyes. It has a pair of white tusks. It loves to eat branches of trees, bamboo, leaves and fruits. It is a pure vegetarian animal. The wild elephants are always very dangerous. But the pet elephants do many useful works. They can carry heavy loads. A pet elephant is kept in a zoo or circus. It shows tricks in the circus. They are very talented and faithful. Many valuable things are made out of its tusks. The elephant is the biggest living animal on the land. It looks dark grey and ugly also. It has four pillar-like legs, two very big ears, two small eyes, a small tail, two tusks and a long trunk. The trunk of the elephant is like the hand of man. It uses its trunk as a hand for eating and working. It can also break up big branches with the help of its trunk. It is usually seen in the forest of Burma, Cambodia, India, Africa and Thailand. In India, it is found in Karnataka, Assam, Mizoram, West Bengal and Arunachal Pradesh. The elephant-like to eat leaves, branches of trees, fruits, etc. They like to bathe and swim in the rivers and streams. It is very useful when it is tamed. It helps us bring large wood logs from the forest. It is very calm, animal but when it's become angry or hurt it is very dangerous. After the death of the elephant, beautiful articles are made from its tusks and bones. Combs, Buttons, Ornaments and other decorative things are made from its tusks. In the past, they were used on the battlefields. Nowadays elephants are used in a zoo or in the circus for public show.